Karnasch Professional Tools offers more than 1,800 different rotary burrs in stock. 15 different cutting edge shapes and 9 different cutting edge geometries, as well as special end mills for locksmiths and mini cutters, the Karnasch burrs and rotary burrs cover every possible area of application. They are available in the tool coating variants BLUE-TEC und BLACK-TEC. 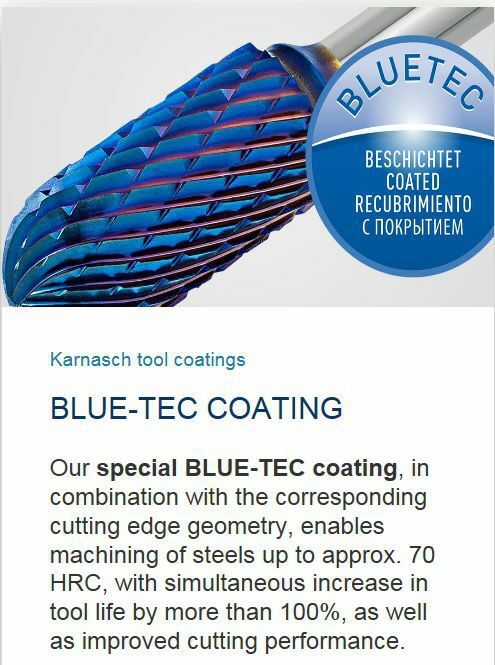 Karnasch carbide burrs have optimized front sides for an improved cutting efficiency and extremely smoothly grinded milling surfaces (mirror grinding) for higher material removal. Only the best micro-grain carbide types are used for Karnasch burrs and every single burr is 100% tested for robustness and safety. Karnasch carbide burrs / rotary cutters enable the machining of steel, stainless steel, aluminum, non-ferrous metal, soft metal, plastic, GRP/CRP, nickel, cobalt and titanium alloys. 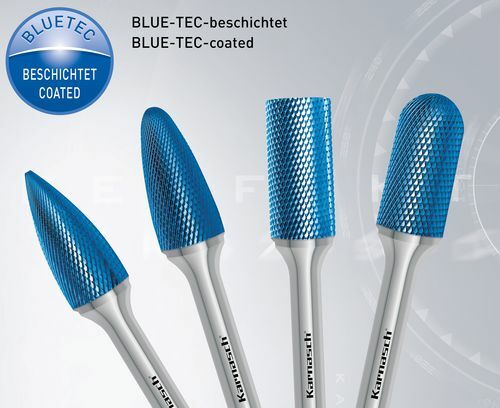 Karnasch's range of burrs is available in diameters from 1.5 mm to 25 mm, with specially adjusted coatings. Depending on the area of application, up to 10 different gearings are available.